Considering the renaissance the PSP has had in Japan, it wasn’t going to be long until Banpresto cottoned onto porting the old PS2 Another Century’s Episode games to the PSP. The imaginatively titled Another Century’s Episode Portable consequently covers much of the same functional ground as the PS2 games did (rather than that of the PS3 release, which changed much of the how the core game worked). For gamers that have played the older PS2 games, then this news will be a great relief. As the somewhat bizarre control choices in ACER definitely hampered the game. The fact that ACEP has eschewed much of what ACER offered has returned the series back to its former itself. Ultimately, the regression has been a shrewd one as it has made the overall game far more cogent and manageable. Especially considering that any kind of functional inadequacy in terms of controls are normally magnified within the small confines of almost all hand-held consoles. What has resulted though, is a relatively mixed setup that works competently for the most part but at the expense of the production value the series has been known for. Subsequently ACEP is an interesting mix of a few games. The combat and controls are very much taken from ACE2 and 3, in that the boosting setup used in the PS2 games has returned and requires ballistic management in terms of firing arcs when engaged. In addition, close combat uses far shorter and easily interruptible animations now too. So you can disengage relatively easily, though once committed to a combo the animation will need to play out. One other element for the boosting is a high speed setup taken from ACER, this is initiated by holding down the boost button. Considering that the ballistic boosting setup is present in ACEP, the high speed version makes more sense now; as it’s purely meant for covering large distances quickly. It also shows up how lacking ACER was to remove the ballistic boost in the first place. In short, this boosting system and approach to combat defined the excellent PS2 ACE games and in many ways, ACEP has cherry picked the best elements from these mechanics. Despite being on a handheld, the controls are pretty much spot on. Following on from this though are the slightly less sensible design choices, of which fall into broadly two categories; weapon management and resupplying. In the PS2 games, weapons reloaded on the fly and could be selected via drop downs or a button modifier. This meant that you could easily select various weapons very quickly as well as stay in the fight without the need to resupply. In ACEP, the weapon selection is handled via scrollable panels and they all have a finite supply of ammunition that doesn’t reload on its own. This means you now have a deadzone in terms of weapon selection, as you have to scroll through the weapons you don’t want to get to the ones you do, as well as often running out of ammo when you’re in the throes of battle. Whilst you always have melee to rely on, as that is thankfully in infinite supply, the range weapons do constitute the bulk of the combat and this new restriction does undermine this. ACEP handles the resupplying via areas on a level that once locked onto and within suitable range will renew your ordnance and health. However, to make matters more awkward these points are often away from the critical path in terms of map progression. This is also another strange addition to ACEP, as some levels are comprised of multiple maps that you move between. This was a system used quite appallingly in Gundam Assault Survive, however the big difference here is that the maps are quite discrete in size which makes them far more manageable. In addition, the number of maps used is often that large either so you can still blitz through a mission quickly enough (something that lends itself to the portable nature of the system). Not all missions are laid out this way either, so you do get a fair bit of variety out of this setup. That said, what still transpires though is a situation where you run out of ammo and have to travel through a few maps to resupply. It breaks the flow of the combat quite noticeably and does feel very awkward and unnecessary, especially when the older games never needed to do this. This is where the new panels somewhat come in, as you can add new panels to your mecha that can act as a resupply in the field (as well as offer a slew of powerful attacks). This does somewhat help the finite ammo issue but it would have made more sense to drop the setup entirely and return to what worked already. In total, the missions are split into 9 “blocks” with various missions within them. This lends itself well to a hand-held, as you can dip in and dip out of the game at your leisure. There are also nice nods to other missions from the PS2 games as well. 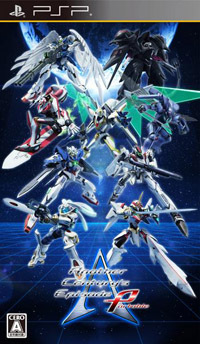 Unfortunately, the game only has 66 playable mecha though which is a little on the light side for an ACE game, thankfully the roster is quite varied so there’s a fair amount of choice still. Visually, the mecha look good but it’s very clear that ACEP was made on a budget as the game engine is pretty lacking. Whilst the framerate is pretty decent, the environments and draw distance are disappointing. Following on from this, there is now a custom soundtrack option (as per ACER), this is obviously so that Banpresto can sidestep paying the royalties for the licensed songs. Therefore it’s worth clarifying that in relation to Artdink’s Gundam Battle and Macross games on the PSP, that ACEP by no means wins out. As a whole From Software have dropped the mechanical ball somewhat on the PSP and it’s only now that they’ve begun to pull their finger out. ACEP is by far their most competent effort thus far but Artdink are still the leaders of PSP based mecha gaming. Overall then ACEP is by no means a looker and despite a few design issues (finite ammo and the extended map setup) the game does play well. Due to Banpresto’s stingy approach on the game’s budget, From Software were allowed to return to what they knew would functionally work. So if you enjoyed the older ACE games and found ACER to be wanting, then ACEP will definitely fill that gap. With any luck, From Software will be allowed to continue this functional approach for subsequent ACE games whilst retaining a decent budget. Out of curiousity, which units did you pick at the start of the game? Layzner, Dunbine and Nanajin. I unlocked all the other units though and fully upgraded most of them. Thanks for the review…I have been thinking about picking this game up, and I still might in the near future. While it does not seem to be as good as Artdink’s MACROSS and GUNDAM games (these are tough acts to follow, it seems), ACEP still looks like a solid, mecha action game for the PSP. First thing that I didn’t really like is how frustatingly hard later missions are when played on single player. (Would’ve liked it if the difficulty between the two were different). 2) Last boss regenerates it’s barrier shield after a while. Is the game in English and where can I buy it? In places like europe or give me websites. It’s only in Japanese and you can buy them via import or through online retailers such as Amiami. Just finished this one and it is quite fun experience. Proper setup of the weapon is the key in this game and units that have lots of armament doesn’t always mean a good thing. I also used Custom BGM alot as the tracks in this game is terrible. I used SRW Remix of the unit’s theme mainly and some of ACE 3 BGM.